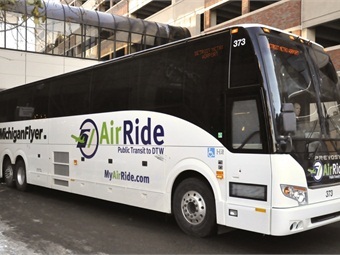 A new software application, RideHop — which tracks Michigan Flyer-AirRide motorcoaches to their destinations in East Lansing, Ann Arbor and Detroit Metropolitan Airport (DTW) — is now available for download by passengers. RideHop enables passengers to track — in real time — the progress of their scheduled motorcoaches along the routes to their bus stops. The app, which is available for Apple or Android smartphones, updates tracking data every three seconds, so that users can actually see the buses moving in real time. “We’re the first public transportation operation in the United States to roll out the superior RideHop app for customers,” said Chad Cushman, VP, Indian Trails, the parent company of Michigan Flyer. Detroit-based RideHop was originally developed as an in-house shuttle tracking solution at Quicken Loans Inc. In 2015, RideHop was recognized with a Mobiprize award for its unique multi-tenant platform that allows riders, operators and regional authorities to view multiple transportation systems in one place. Adopting such innovations is par for the course for Indian Trails, Inc., a 105-year-old, family-owned, bus transportation business based in Owosso, Mich. Previously, it was the first company to install two-way radios, video monitors, stereo sound systems, Wi-Fi, and hearing loops on a fleet of buses.